We are in Kasganj and have excellent work record in hospitality. 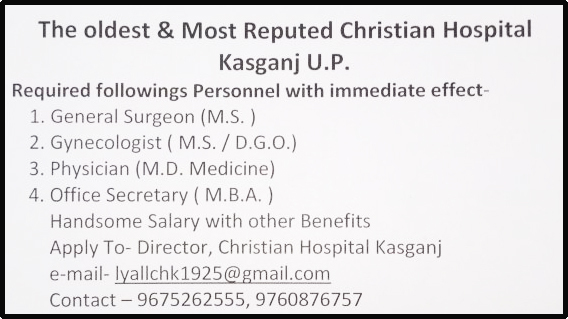 Christian Hospital Kasganj was involved in Eye Work in the form of organizing free surgical eye camps in the hospital and many external eye teams were requested to conduct these camps. In the year 1992 a separate eye department was started to prevent and cure blindness in an area around Kasganj. In the year 1998 a separate eye hospital was constructed with a good infrastructure and very experienced eye team was engaged to conduct Eye work. The District authorities recognized our work and we became the biggest NGO of the district in the field of eye work. We are shortly planning to launch an out reach program in eye work to deal with the holistic aspect. This will help community in the prevention and cure of reversible blindness, as the great need of the community. We have also started Eye Hospital at Etah in the year 2007. a new Dental Department was also established in the year 2007. There persists a unique vicious circle of poverty, ignorance, superstition and illiteracy in the community in which this hospital is serving. The hospital also led as a pilot agency for a study on post abortion complication by PRIME INTRAH. At present the hospital is empanelled under Rashtriya Swasthya Bima Yogna of Central government of INDIA. The hospital is registered under Societies Act. 1860 and is exempted under the Income Tax 12 A and also registered under 80G of Income Tax Act- 1961. The hospital is also registered under Foreign Contribution Regulation Act 1976. Now I am very happy to inform you that the U.P. State Medical Faculty, Lucknow and Govt. of Uttar Pradesh has granted permission to start Paramedical Courses and A.N.M. Training in our hospital so that many young men and women will get the opportunity to build their career in various medical sciences and help our country.